What is the best 4 person tent for 2019? You may not need a huge family tent, and whether you’re hiking long distances, camping remotely, or going at it solo, a smaller tent is the way to go. We’ve compiled this review of some of the best 4 person tents that are available this year and that have impressed us the most. We’ve narrowed it down to the top 10 four person tents for 2019 that would work well on your next camping trip or outdoor excursion. With a new year comes brand new and exciting tent designs from some of the top manufacturers like Coleman, Browning, Eureka!, and many others. With each vying for that top spot, we’ve put together this summary of some of the newest tent features to look for in 2018 and 2019. Coleman has been focusing on perfecting their pop up tents by introducing their fast pitch technology into more of their products. This is super useful because it reduces the effort and time involved to set up a tent. We’ve all fumbled around with setting up tents either late at night with a flashlight in hand or at times when we would rather be enjoying the outdoors, so it makes perfect sense to streamline the user experience. Coleman has also been working on black out tents which act to reduce the amount of visible light that enters. This is extremely helpful for those who like to sleep late and not be woken up at sun up every morning. Black out tents can also help block the suns rays and provide a cooler atmosphere inside the tent. Coleman claims their Dark Room Technology can block as much as 97.5% of visible light from entering a tent, which is a considerable difference from the standard options. Eureka has been developing some innovative tents and their new Midori lineup is no exception. Developed as a backpacking tent, it was designed to be as lightweight as possible. It weighs in at only 4 pounds which is one of the lightest of its kind. It’s offset ridge pole design maximizes headroom in a way we haven’t seen before. Rather than all the headroom in the center like a dome tent, the Midori’s headroom is offset to one side so you can sit up and not have to shuffle around to reach the largest open space in the tent. Throughout our search for the best 4 person tents for 2019, it’s easy to see that the top rated camping tents all have several things in common. They are all rugged enough to withstand the harshest elements like rain and wind, they offer adequate ventilation for those hot summer days, and they have enough room to sleep 4 people. Below is our list of the top 5 best 4 person tents for 2019. The Coleman Sundome 4 Person Tent is our TOP PICK! Coleman has always been a leader in producing some of the best camping tents you can find, and for a 4 person tent, the Sundome Lineup is the perfect mix of space, ventilation, and affordability. 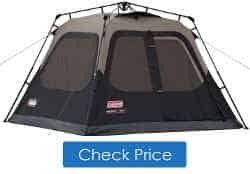 The Coleman Sundome 4 Person Tent is one of the largest tents on the best 4 person tent 2019 review. It’s 9 foot wide interior allows for a queen sized air mattress to easily fit with room to spare. Fitting 4 individual sleeping bags would not be a problem either. It comes with a rain fly for added protection from the elements. This, coupled with Coleman’s WetatherTech system, fuses the seams together to prevent water intrusion. This combination allows for some of the best weather protection possible out of a 4 person tent. It’s still advised that if you are expecting really bad weather for extended periods to add a standalone tarp both over and under the tent. Set up time for the Sundome 4 Person Tent can be completed in less than 10 minutes with very little previous knowledge about tent construction. Simply connect the support poles and insert them into the snag free tent guides and you’re done. Other features include mesh inner storage bags for smaller items like smartphones, and ventilation flaps that can be configured for wind direction. The Sundown 4 Person Tent is the perfect introductory 4 person tent at a great price. It’s one of the most spacious tents in its class, and comes with Coleman’s 1 Year warranty. It’s our top pick for the best 4 person tent for 2019. Browning has been putting their name behind some great tents lately, and the Glacier 4 Person Tent has been receiving some great reviews. Like the Coleman Sundome, it’s extremely spacious at 9 feet by 8 feet, but it also moves away from the traditional dome tent by offering a square dome with 6 feet of center height. This is a 4 person tent you can stand up in. The Browning Glacier 4 person tent is spacious enough for 1 queen sized bed with an extra 1-2 feet on either side to spare. Its square dome allows for anyone under 6 feet tall to stand and move around without having to hunch over. The added space also creates a great design for hanging articles of clothing and gear to dry out for the next day. Unlike most 4 person tents, the Browning Glacier comes with a rain fly that covers almost the entire tent. This comes in extremely handy because windblown rain can enter from the most unexpected places. Having a rain fly that extends ¾ down the side of the tent helps reduce unexpected rain intrusion that lesser 4 person tents have a hard time battling. Reinforced #10 door zippers insure smooth operating and years of trouble free use. The Rain fly creates a large vestibule at the opening of the tent that offers added protection from the elements. Place your backpacks and gear in the vestibule out of the rain and elements. The Browning Glacier 4 Person Tent is one of the largest 4 season tents in the best 4 person tent 2019 review. Its added rain protection from the extended rain fly is a nice added feature. For a long lasting and well-designed 4 person tent, check it out, you won’t be disappointed. Easily one of Coleman’s most popular tents, the 4 Person Instant Cabin is where functionality meets affordability. Add a quick setup of less than 1 minute and it’s easy to see why it’s ranked high on the best 4 person tent 2019 review. The Coleman 4 Person Instant Cabin was designed around one aspect, quick set up time. The support poles come pre-constructed, so they only need to be unfolded to fully assemble. Pitching can be completed in 60 seconds by just one person. It’s incredibly simple. While it’s not the largest 4 person tent available, its 8’x7’ interior is large enough to fit a queen size air mattress with room to spare. The 5 foot center dome is a nice added feature from traditional dome tents. It comes with a carrying bag that easily fits everything you need. One problem with most tents is trying to get all the items back into the bag. The large carrying bag that comes included with the Coleman 4 Person Instant Cabin assures you’ll fit everything easily since it’s nice and spacious. The Coleman 4 Person Instant Cabin is one of the most affordable tents we’ve seen for what you get. It can be found for under $100 at Amazon.com. This affordability, plus the fact it can be set up in 60 seconds, makes it a great option that the kids could assemble by themselves or set up by one person without any problems. 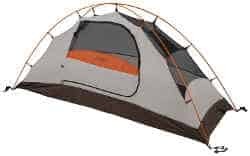 The Eureka Copper Canyon has the tallest dome height of any tent on the best 4 person tent 2019 list. Measuring in at a whopping 7 feet, almost everyone will be able to move freely without having to hunch over or hit their head on the top of the tent. 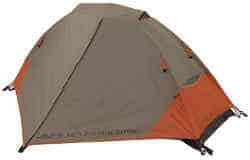 Geared toward early spring and fall weather, the Copper Canyon 4 person tent is not your do it all 4 seasons tent. Its rain fly only covers a small portion of the top of the tent and wind-blown rain can enter through the sides. However, if inclement weather is not a problem, the 4 sided vents allow for a great breezeway for those summer or fall nights. Its lack of weather protection can easily be rectified with aftermarket tarps to beef up the rain protection, and even with its tall center height it does surprisingly well in the wind. If you need a 4 person tent that makes changing clothes easy and being able to stretch, then look no further. It’s the tallest 4 person tent you can find. The large D-shaped door makes for fluid entering and exiting and can even be left open for more ventilation. It does lack inner storage compartments, but it fits one queen size air mattress with ample storage room on all sides. For an affordable tent that you can stand up in, check out the Eureka Copper Canyon 4 Person Tent! ALPS not only makes great tents, they also supply tents for companies like Browning to rebrand. That’s a lot of trust for other companies to be willing to use your product as their own. ALPS also has their own tent lineups like the Lynx 4 Person Tent which has everything you need in a tent and nothing you don’t. ALPS is mostly known for their backpacking tents, but the Lynx Series of tents adds a whole other element to the equation. Weighing in at less than 8 pounds, consideration can be made that the Lynx constitutes as a backpacking tent. This is important to mention since finding a 4 person backpacking tent can be very difficult. Many 4 person tents weigh more than most people are willing to carry, but 8 pounds is very manageable. 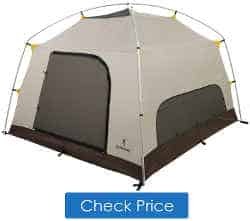 When it comes to evaluating tents for the best 4 person 2019 tent review, aspects like size, weight, and added features all come into play. The Lynx comes with 2 internal mesh storage bags, a loft bag, and a vestibule to store your gear. Its size is perfect for 2 people and one queen air mattress. 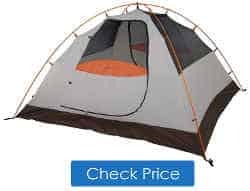 For a tent to be labeled the best backpacking tent of 2019, it must have three important aspects. It must be lightweight, compact, and durable. Backpackers know that weight from useless items will only make the trek more physically demanding. So with that in mind, one of the lightest, compact, and durable backpacking tents we’ve found, while still being affordable, is the ALPS Mountaineering Lynx 1-Person Tent. Weighing in at 3 lbs 8 oz. when removed from the carrying pack, the Lynx 1-Person Tent is so light you barely notice it. It manages to stay light be incorporating aluminum poles and durable 185T Polyester material. Its compact size takes up 6” x 17.5” of pack space, so it’s compatible with most mid-sized packs. It’s important to note that the Lynx is not the lightest backpacking tent available, but at its price it cannot be beat. Set up time can be completed in under 10 minutes and expands to a size of 3’ x 8’ which is more than adequate room for 1 person. The handy external vestibule allows for storing packs and other equipment out of the elements. It will easily fit a 65L pack. The Lynx 1-Person Tent comes with 3 internal mesh pockets to store smaller items. When you break it down, the ALPS Mountaineering Lynx 1-Person Tent has all the features we would want from a lightweight backpacking tent. It’s simple design and features are everything you need without any useless aspects that would be a hindrance out on the trail. It’s also our top pick as the Best Backpacking Tent Under $100 at Amazon.com. Check it out for your next backpacking trip. Camping doesn’t have to be expensive. There are several cheap camping tents that provide both usable durability and space while staying under budget. Expectations should be limited though since quality tends suffer as the price gets lower. Obviously if you camp frequently, a tent like the Coleman Sundome would provide more uses than cheaper tents. Below are our top picks for the best cheap tents for 2019. SEMOO recent came out with a 3-4 person tent that is set at a price point that is hard to believe. Measuring in a 9’x7’, it comfortably sleeps 2 people and fits one queen sized air mattress. It’s made out of 190Y Polyester, which isn’t the top of the line material by any standard, but with added tarps both above and below, will provide adequate protection from the elements. The SEMOO 4 Person Tent can be found for under $50 at Amazon.com. Another cheap camping tent up for consideration is the EverKing 4 person tent. It measures in at 6’x6’ which struggles to fit 2 people and a queen sized air mattress would be a tight fit as well. It will hold two sleeping bags just fine though. The big selling point is the pop up tent design which sets up in 60 seconds. The only ventilation is the tent door, so keep that in mind if you plan to use it during the summer. The EverKing 4 Person Tent can be found forunder $40 at Amazon.com. 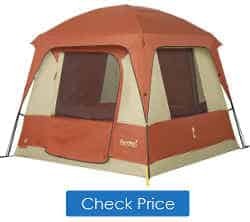 The final cheap camping tent to consider is the Mountain Trails South Bend 4 Person Tent. It measures 9’x7’ which is plenty of room for 2 people and a queen sized air mattress. 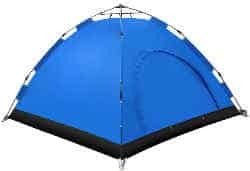 This basic tent comes with a rain fly and ventilation through the top of the dome. The carrying bag is incorporated into the tent design itself. 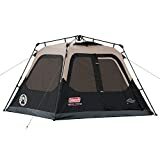 The South Bend 4 Person Tent can be found for under $50 at Amazon.com. Pop up tents are some of the easiest tents to assemble and most convenient for those with limited time on their hands. Gone are the days of reaching the campsite late in the day and having to spend an hour assembling support poles and fumbling in the dark with other odds and ends. Pop up tents solve all those problems and assemble in just minutes. One of the best 4 person pop up tents for camping is the Coleman 4 Person Instant Tent. Revolutionizing the way we think about tent assembly, Coleman has developed the Instant Tent Series to be set up in a minute or less. The Coleman 4 person tent has a 60 second set up time if you can believe it. Made of 150D polyester, it’s durable for just about any outdoor camping situation. Just keep in mind that you will need a rain fly for added protection against the rain, but that’s pretty standard. Coleman’s WeatherTech system insures all seems are welded or inverted to prevent moderate rain and dirt intrusion. The 60 second set up time is made possible by the pre-assembled support poles. You simply unfold the tent from its carrying case, extend the 4 corners, and secure the poles. It’s so simple that event the kids can do it. The Coleman 4 person Instant tent measures in at 8’ x 7’ which is spacious enough for a queen sized air mattress with room to spare. Look no further than the Coleman 4 person Instant Tent as the Best Pop Up Tent for 2019. It’s 60 second set up time is a leader in its class, and the added weather proofing and spacious interior help complete the overall package. 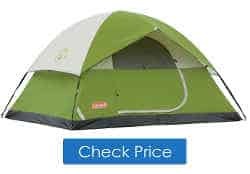 It’s also one of our top picks as the best camping tent under $100 at Amazon.com. Check it out, you won’t be disappointed. Thinking outside the box, car and truck tents make a great alternative camping method in certain situations. Maybe you enjoy your vehicle a little too much, or maybe you want to max out the space you have available. Never mind the reason, some are just plain cool as well. For a more conventional car camping tent, the Rightline Gear SUV Tent converts any SUV into a 4 person tent. It does this by attaching to the rear of the SUV and basically extending the vehicle cargo area 4 more feet. Between both sleeping surfaces, you can fit 6 adults in it which is pretty impressive. You’ll be able to recharge your power devices using your SUV by running a power cord from your 12V adapter into the tent. Convert your SUV into a camping tent with the Rightline Gear SUV Tent. Rightline also makes a truck bed tent which attaches directly to the bed of any truck. It sleeps 2 adults and fits one queen size air mattress perfectly. Get up off the ground with this truck bed camping tent. What will be your next 4 person tent in 2019? We reviewed some of the best camping tents for 2019 that provide spacious interiors, durability, and a host of features that are sure to make your next camping trip a memorable one. Our top pick of the best 4 person tent 2019 review goes to the Coleman Sundome 4 Person Tent. It can be set up in less than 10 minutes and comes with Coleman’s WeatherTech system for added protection against the elements. It’s durability is one of the tops in it’s class, and will provide many years of use without falling apart. For a do-it-all tent at an affordable price, the Coleman Sundome is hard to beat. Our top pick for the best cheap camping tent for 2019 goes to the SEMOO 4 Person Tent. It comfortably fits a queen sized air mattress and folds up compactly. For occasional camping trips on a budget, it can be found for under $50 at Amazon.com. 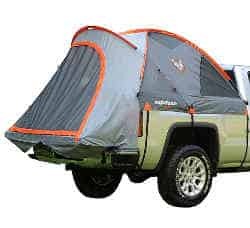 Finally, the best car camping tent for 2019 goes to the SmittyBilt Overlander Tent. This innovative car tent attaches to a Jeep Wrangler and mounts to the top of the vehicle. Its 600D polyester construction is heavy duty material that is some of the most durable in its class.